As far as quantity is concerned, for the moment, I am mainly using the Daily Value recommendation of 50g per day. In reality, you may have a different target, but by the time my quality indicators are incorporated into my nutrition data, the selection process should be based on Personal Nutrition Requirements. Beans, chicken, eggs, fish, nuts and tofu are better than red meat. Processed red meat should be strictly limited. Foods from the high protein list are better than protein shakes. Many protein powders are loaded with sugars and other additives. Go meat-free at least one day a week. Moderate soy protein is good. If you have grown up with soy, then more is OK, but if you are not used to it, digestion may suffer. Crucially, like red meat, stay away from highly processed soy. It is often much too high in salt. Switching highly processed carbohydrate to good quality protein is healthier, and can help you lose weight. My high protein foods list shows all components of the PRAL calculation, with data initially presented in protein content order. 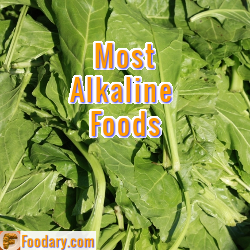 Other components are there to help you maintain pH balance diet. You can click on headings for different sequences, and repeat clicking reverses the sort order. Food and drink items are presented in serving sizes that provide 100 calories of energy. For pH balance, about 20% of what you eat should be acidic. Acidic foods show as positive PRAL scores. You can click links in the table headings for more information. Just focusing on protein is a bad way to plan an alkaline diet. If you believe you have too little protein in your diet, then this list will help you find better food sources. Similarly, if you have too much protein in your diet, then reducing intake of some of these high protein foods will give you better balance. If you have any questions, experiences, or opinions about protein in your diet, please join the Protein for pH Balance discussion.